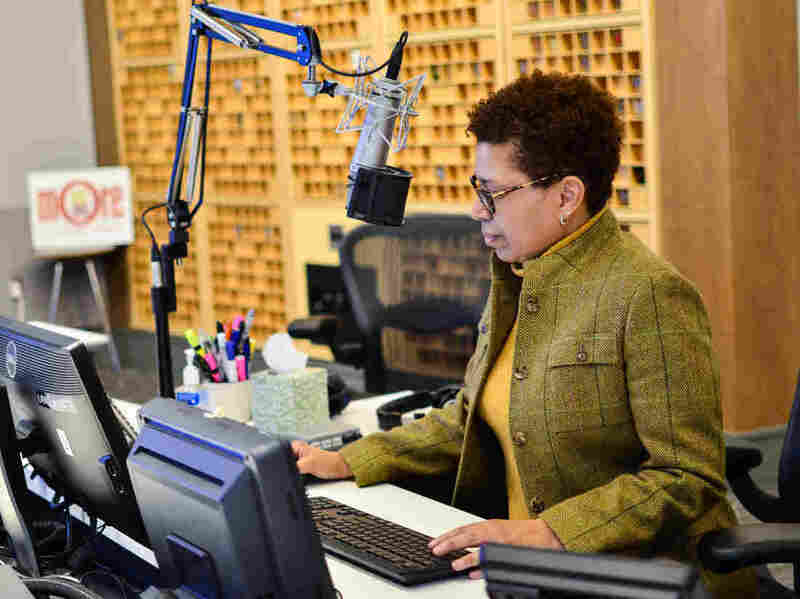 Race At NPR And The End Of 'Tell Me More' : NPR Public Editor The demise of the show dedicated to diversity has provoked listener concerns and internal responses. How's NPR doing? Depends on your measure. Here's a look at the numbers. Tell Me More is hosted by award-winning journalist Michel Martin. Hundreds of listeners have written passionately to protest NPR's decision to shut down its talk show dedicated to themes of diversity, Tell Me More, come August 1. I find it shocking that such an important platform for talking about race, ethnicity, and gender issues, is being yanked off the air. NPR needs more programs like it, not fewer. Tell Me More is the only show I know of that features "minority" stories as just regular stories.....Where else can you hear a discussion about the issues of the day and the panelists are from four or five different ethnic or racial groups but no one is expected to be the spokesperson for their ethnicity or race? Yet at the same time the discussion has a distinctly different flavor to it than the typical "three white guys, a woman and a minority" panel? Tell Me More gives voice to the United States — and really, the world — that I know and live in, and it is a voice that we need more of, not less. I am a 52-year old white suburban mom with 4 kids who enjoys this show immensely. Although it may have been designed as a show for people 'of color,' this show speaks to women of all races and ethnic backgrounds. I agree that cancellation of the journalistically excellent seven-year old show is sorrowful, and I don't think I am talking out of school when I say that this seems to be a feeling shared up and down the NPR hierarchy. The reasons for the closure, as Chief Content Officer Kinsey Wilson has made clear in a number of public statements, are that the show had a relatively small audience, lost money and is a victim of shifting strategies to keep up with changing times. One change is the growth of excellent local talk shows by member stations; many don't need or want to run the national show. See the chart at the bottom. The other reason is that while NPR's on-air audience has been stagnating, its online audience has been growing dynamically; more internal resources are being freed to meet the digital demand. Diversity, of course, means many things, among them region, ideology and gender, but let's focus on the central concern surrounding the shut-down of Tell Me More, which is race and ethnicity, even though the show covered much more than that. Wilson insists that emphasis on diversity will be re-doubled in NPR's remaining flagship shows, Morning Edition and All Things Considered, as well as their weekend counterparts. Tell Me More host Michel Martin will work with a special team to produce segments for those shows. Online, meanwhile, NPR's one-year old, groundbreaking blog, Code Switch, is going strong; its team produces for radio, too. The online site has formed a partnership with former host Michele Norris and her popular Race Card Project. NPR also distributes, but does not produce, Latino USA and Snap Judgment. Each of these is a journalistically admirable effort. You will decide for yourself whether they are enough. 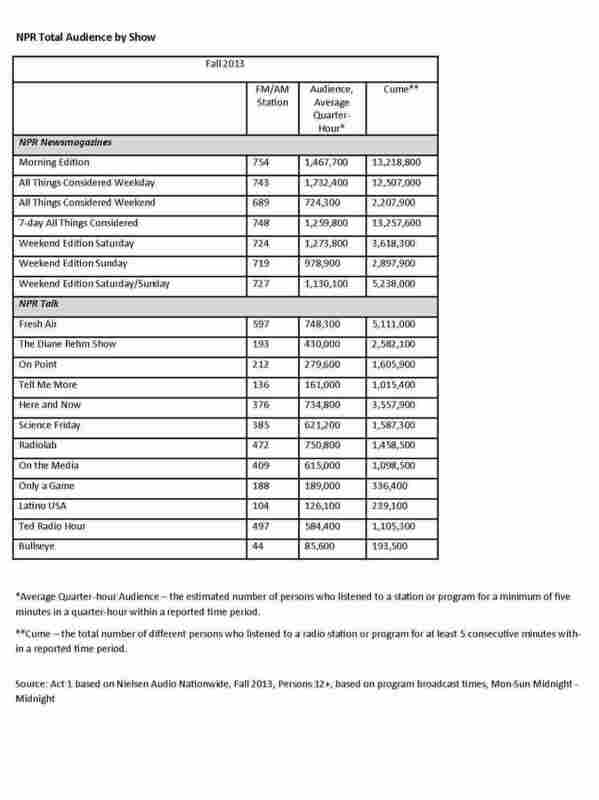 What might help you judge, especially with the demise of Tell Me More, is to look at NPR's audience and staffing. The table below updates the core numbers from a large study and its follow-up that I did two years ago. You will see that the audience last year for member stations that run NPR's news programs—the closest proxy publicly available for the shows themselves—was 5 percent African-American, 6 percent Latino and 5 percent Asian-American. For blacks and Latinos, this is less than half their proportion in the nation's adult population. Not so good, seen that way. The 'white suburban mom,' is in fact the typical Tell Me More listener. But it looks very different seen through the lens of a breakdown of college-educated Americans. 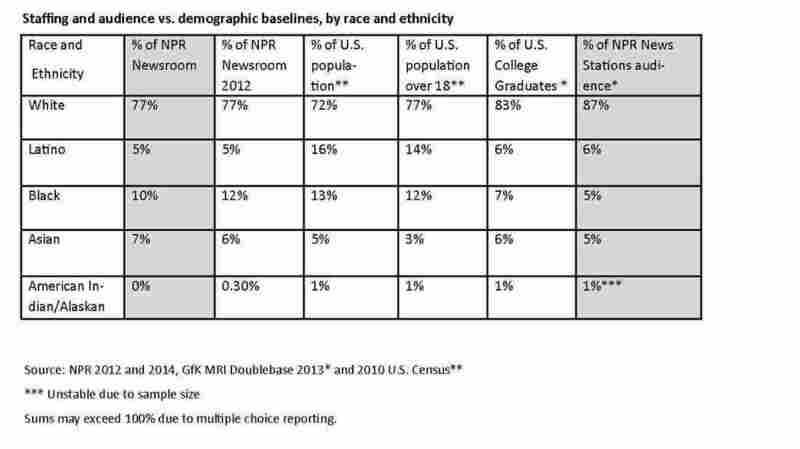 For better or worse, the public affairs programming of NPR appeals mostly to Americans with a college degree, regardless of race or ethnicity. By this measure, black listeners index exactly the same as their proportion of college graduates in the wider society. College-educated Latino listeners are lower but within shouting distance. Asians present the opposite picture. Twice as many Asian-American adults listen to NPR news stations as their weight in the population. Among college graduates, however, the proportions converge. The chart registers a 1 percent proportion of Native Americans across the demographic and audience measures, but the numbers are so small that they are not reliable. No conclusions can be drawn, except to say that there are some Native American listeners. The end of Tell Me More is unlikely to greatly affect these figures. This is due to the peculiarities of the show's audience. It is small, and while it has a higher proportion of blacks than other shows, according to Nielsen Audio data, its listenership is still overwhelmingly white. Listener Padgett, the "white suburban mom," is in fact a typical Tell Me More listener. NPR has undertaken a concerted effort to "sound like America." So, if NPR's shows are expected to reflect the interests and voices of all the nation's races and ethnic groups, then clearly it helps to have those groups represented in the newsroom. The chart also shows staff breakdowns, including from my 2012 study and what they were following layoffs announced May 20, including from Tell Me More. The numbers are of reporters, editors, producers, designers and other full time newsroom professionals, and not administrative support. NPR had 365 such professionals after the layoffs. You will see that Hispanics in particular are under-index in the newsroom compared to the population. In the last census in 2010, Latinos made up 14 percent of the adult population and growing, but they make up only 5 percent of today's NPR newsroom. This, roughly a third of their adult population weight. The proportion of blacks in the newsroom has actually dropped over the last two years. It dropped to 10 percent from 12 percent, which had been equal to the adult population weight. Asians significantly over-index in the newsroom, though their absolute numbers are small. NPR had one Native American newsroom staffer in 2012. It has none today. Reflecting the true fabric of this country is at the core of our mission. But, again, the record looks significantly different if you look at college graduates, though for other reasons. They are a rough measure of the available hiring pool. A college degree is virtually a standard requirement in newsrooms today. Indeed, many applicants have graduate degrees. As much as we in the news media argue that we have a special need for minority hires because we have a mission to inform all Americans, and not just college educated ones, almost every other profession—medicine, law, engineering, finance, education, government, etc.—has its own legitimate need for them. We in the news media are often the first to demand that those professions reflect America, too. The hiring competition, in other words, is fierce. Then there is the not-so-small matter of a graduate's personal preferences. I teach at Columbia University's Graduate School of Journalism, and the relatively low pay in the news media today is one reason why the typical American applicant seems to be a white woman from a family solidly in the middle class or higher. These seem to be the aspiring professionals most willing to work for small paychecks, or who can afford doing the unpaid or little-paid internships that are a standard route into the profession. African-Americans make up 5 percent of the college graduate pool but 10 percent of the NPR newsroom, or twice their weight in the pool. Latinos slightly under-index: 6 percent of college graduates versus 5 percent in the newsroom. Asians over-index at NPR once more: 7 percent of the newsroom versus 5 percent of the pool. Diversity numbers and percentages are important because they give a basic, at-a-glance indication of how we're doing. They're most useful when they illustrate extremes — huge success and huge deficits. But there's no magic percentage at which we're done, no matter how favorably we compare to the college-educated workforce or to the demographics of our audience. Those metrics don't get at the critical nuance of diversity: Are people being included in ways that can change the organization, not just our hiring stats or a few sources and stories? That's hard to do if people aren't here — thus, the focus on numbers. But our mission is bigger: to bring more voices, ideas, points of view to the table, then let them make us better by telling the whole story of this country. The bottom line is that on our flagship shows, our sources are overwhelmingly male, white and concentrated on the coasts. Our hope is to initiate a wide range of micro-initiatives that quickly reach into every corner of the newsroom. We'll test and learn, look to better understand the opportunities and the obstacles, and establish best practices that we can share. We're in this for the long haul. We've already started a second year of research so we'll have a year-to-year comparison. That research focuses on our broadcast work, but I'm asking everyone to take this lesson to heart on our digital platforms too. There are things we can all do in the short term to expand the range of stories we tell and the people we put on air and online. Reflecting the true fabric of this country is at the core of our mission. It will not only make our coverage stronger and more interesting, it will also make it more meaningful to a broader audience. This is a huge opportunity for us, and to make it real, we all have to work at it every day. Clearly, the commitment is a strong one. Each of us can carefully listen, and read, and decide how well the promise is fulfilled going forward. Here, meanwhile, is the chart that shows the audience for all of NPR's shows and part of the reason for the sad demise of Tell Me More. Editorial researcher Annie Johnson contributed to this article.